Lucas #407 PolyPan® Straights and #408 PolyPan® Corners are used for sealing around penetrations on all flat roofs. #407 and #408 are designed to be configured in a variety of sizes to accommodate various penetrations. Ideal for single-ply applications. 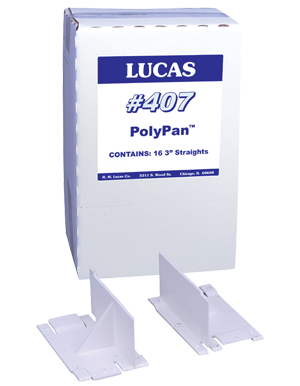 Lucas #407 and #408 PolyPans® are constructed from a high strength polymer.